The sequel to Breaking the Ice: From Land Claims to Tribal Sovereignty in the Arctic, titled On Thin Ice: The Inuit, the State and the Challenge of Arctic Sovereignty, is now available from Lexington Books. On Thin Ice explores the relationship between the Inuit and the modern state in the vast but lightly populated North American Arctic. It chronicles the aspiration of the Inuit to participate in the formation and implementation of diplomatic and national security policies across the Arctic region and to contribute toward the post-Cold War re-conceptualization of Arctic security. With the warming of the polar regions, the Arctic rim states have paid increasing attention to the commercial opportunities, strategic challenges, and environmental risks of Arctic climate change. As the millennial isolation of the region comes to an end, the Inuit who are indigenous to the region are showing tremendous diplomatic and political skills as they continue to directly engage the more populous and powerful nation-states that assert sovereign control over the Arctic, in their ongoing effort to mutually assert joint sovereignty across the region, and to ensure that Inuit values are incorporated into the national and global policy equation. Published on the 50th anniversary of Kenneth Waltz’s classic work of international relations theory, Man, the State, and War, On Thin Ice is at once a tribute to Waltz’s pivotal elucidation of the three levels of analysis as well as an enhancement of his famous “Three Images” with the addition of a new “Fourth Image” to describe a tribal level of analysis. This model remains salient in not only the Arctic where modern state sovereignty remains limited, but in many other conflict zones the world over where tribal peoples retain many attributes of their indigenous sovereignty. University of Calgary political scientist Rob Huebert, and long-time Edmonton Journal journalist Ed Struzik, have contributed to On Thin Ice: Professor Huebert has authored a guest foreword to the work, introducing the topic of Arctic sovereignty to the readers and framing the analysis that follows; and Ed Struzik, himself a prolific author on the Arctic and one of the first who predicted the “End of the Arctic” more than a generation ago, has authored the afterword to On Thin Ice, sharing his reflections on Arctic sovereignty, the topic of his next book. Their contributions not only help to frame Zellen’s discussion of Arctic sovereignty and its challenges, but present a snapshot of their own fascinating work in this area. As with Breaking the Ice, the front cover includes a beautiful photo shot by nature photographer Michael Sewell of Visual Pursuit Studio, additional proof that you can indeed judge a book by its cover! ...the original cover mockup for OTI! 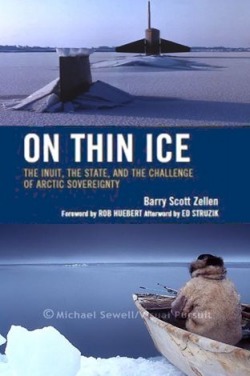 In arguing that history has not served the interests of Arctic peoples especially well, Barry Zellen’s On Thin Ice: The Inuit, the State, and the Challenge of Arctic Sovereignty (2009), addresses contemporary Indigenous relations with academic integrity. Zellen’s examination focuses on Inuit peoples throughout the Arctic, and although it is not restricted to the Canadian North, it addresses issues of land claims and self-government specifically related to Canada’s past. The author argues that the welfare of the nearly 130,000 people living in Canada’s Arctic regions, of which the Inuit represent a significant portion, has been seriously affected by the political, military, economic, and climatic events that have unfolded in the past. Zellen examines construction of the DEW Line and of energy and mining developments that employed southerners rather than northerners, and the immediate impact on affected Indigenous populations. He describes, for example, the relocation of Inuit from northern Quebec to the High Arctic, and explains how school systems forced families from their lands. But this study moves beyond an examination of past trials and tribulations of the Inuit to chronicle their contributions to the reconceptualization of Arctic security. On Thin Ice is a thorough examination of current issues facing both Canada’s federal government and the regions Indigenous populations. The challenges faced by Ottawa and the Inuit are significant because of social and economic conditions in the Arctic that are changing quickly, and with global warming causing greater uncertainty in the near-term, Zellen considers it imperative that Ottawa address and resolve these issues to the best of its ability whilst ensuring that the social peace is maintained. In order to protect the Arctic’s resources, it is necessary that Canada’s Indigenous peoples foster strong working relationships with one another and with the federal government, and Zellen’s work is a thorough examination of the unavoidable circumstances that are associated with attempts to reconcile past issues for the betterment of tribal and national security. On Thin Ice is a broad synthesis that examines the current historiography of Indigenous relations in the Arctic. In On Thin Ice, Barry Scott Zellen poses tough questions about Canada's claims to a vast swathe of the soon-to-be hotly contested resource-rich Arctic. Zellen not only shows how much these depend on whether a collaborative and interdependent relationship can be successfully forged with Native peoples struggling to preserve fragile ecosystems and their own ethnic identity, but how conceptions of human security, tribal security and national security are inexorably tied together. Zellen's keen insight and painstaking research suggests that truths from the land of the midnight sun might help to illuminate and guide the struggles of indigenous peoples around the globe. On Thin Ice is a "must read" for the 21st century. Although some governments view the activism of indigenous peoples in those the so-called "ungoverned" areas as real or potential threats to national sovereignty, just as surely those risks are exacerbated by the failure of those same nation-states to consider solutions that allow Native American communities to survive as nations within those nation-states. Proof of the possibility of enhancing national-state sovereignty through recognition of Indian nationality can be found in Zellen's writing. 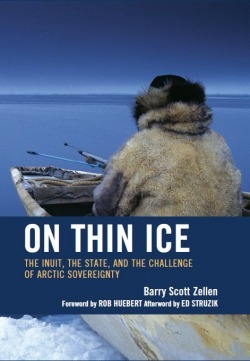 As he explains in On Thin Ice, one of Canada's "most powerful claims" to that its sovereignty in the frozen north is the "increasingly supportive, collaborative, and interdependent relationship to the Inuit of the Arctic, their enduring stewardship over the Arctic lands, seas, and wildlife since time immemorial, and the mutual recognition of each other's sovereignty through the resolution brought forth by Native land claims." Zellen explores how within the last generation the Inuit have made "tremendous gains" in increasing their autonomy and broadening their political power. Now governing partners, indigenous leaders and organizations share in the assessment of environmental risks, mitigating development's effects on traditional subsistence, and participating in economic windfalls in resource royalties, education and training, and jobs. In part due to a "shrewd and powerful" tribal political elite, and in part due to "the tolerance and encouragement and support of the Canadian government," he writes, the Inuit today enjoy "greater autonomy, greater wealth, greater political power, and greater environmental control than any comparable indigenous minority group worldwide."